A still frame from a computer animation shows two binary neutron stars coalescing into a black hole. Taken from the video, "LIGO, A Passion for Understanding," by Kai Staats. 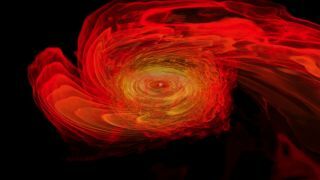 A powerful scientific tool set to come online in 2015 could help scientists spot gravitational waves: ripples in space-time born from violent cosmic crashes light-years from Earth. The instrument, called LIGO (short for Laser Interferometer Gravitational-Wave Observatories), uses lasers to hunt for the gravitational aftermath created by two massive objects — like a neutron star and a black hole — colliding. Scientists theorize that, like a rock dropping into a pool of water, the fabric of space and time can ripple, sending out these gravitational waves across the universe at the speed of light. Understanding those waves could help scientists learn more about black holes. The $205 million LIGO can potentially detect these gravitational waves from Earth. The interconnected LIGO observatories in Washington State and Louisiana make use of two 2.5-mile (4 kilometers) arms. A laser beam is split down the arms that are equipped with specifically placed mirrors. In theory, if a gravitational wave comes into contact with the instrument, it would change the length of one beam in relation to the other. "The actual change in the relative arm lengths of the interferometer [LIGO] due to the passage of a gravitational wave is incredibly small," Michael Landry, LIGO lead scientist said during an interview for "LIGO, A Passion for Understanding," a new documentary about LIGO premiering on Space.com Tuesday (April 15) at noon. "It's just 10 to the minus 19 meters difference in one arm relative to the other, that's one ten-thousandth the size of a proton. "If you were trying to measure the distance between here and the nearest star Proxima Centauri, it would be like watching it change by the width of a human hair," Landry added. An earlier iteration of LIGO collected data between 2004 and 2010, but the newly improved observatory, expected to begin its run next year, will be even more sensitive than the last version of the instrument. "The plan is to take data for the first time in 2015," Gonzalez told Space.com. "We know that they will not be at the best sensitivity they could have, but our estimate is that they will be at least two, perhaps three times better than initial LIGO detectors were. It will be worth taking at least a few months of data, we estimate three months … It's not likely we will see something." LIGO's sensitivity will just keep getting better after the instrument's new three-month run. In the next couple of years, Gonzalez thinks that the instrument's reach could extend 300 million light-years into the universe. While it still isn't likely that the scientists will detect any gravitational waves, it's definitely possible at those distances. Scientists want to probe deep into the cosmos in order to have a robust sample of galaxies where the cosmic mergers could be occurring. "By 2017, we think we will be at … almost 500 million light-years for the average distance," Gonzalez said. "In fact, if the system is well aligned, we can see at least two times farther. At that point, we'll be taking data for about a year, perhaps longer. I'm betting that we will see things earlier, but it would be a very safe bet for everybody that we would see things in that  science run."